Ingrown hair, rashes and redness on bikini lines, underarms, legs, neck and face caused by shaving,waxing, electrolysis? Tend Skin® liquid is very economical to use. One bottle can last three to four months in normal use by one person. For everything you need to know about caring for your skin see a professional beauty therapist. Tend Skin® liquid is a unique skin care product that is specifically formulated to reduce the appearance of all post hair removal issues resulting from shaving, waxing and electrolysis. First developed following a chance discovery by an American Dentist in 1985, Tend Skin® liquid has been a popular product around the world since 1990. In New Zealand Tend Skin® liquid is used by many thousands of women and men and is now considered to be a 'must' for use in conjunction with any hair removal procedure. Tend Skin® liquid is available from leading beauty therapy clinics nationwide. Ingrown hairs form when hairs growing back after shaving, waxing, electrolysis or other form of hair removal, fail to grow out of the skin. Hairs curl inside the follicle under the skin and the resulting foreign body reaction creates an unsightly bump. Women and men suffer from ingrown hairs. Women get them after shaving their legs, bikini lines and underarms, as well as after waxing and electrolysis. Men get ingrown hairs on beard growth areas, chest, back and legs. Applying Tend Skin® liquid to areas that are shaved, waxed or treated with electrolysis, will reduce the appearance of ingrown hair formation that can occur after these procedures. Tend Skin® liquid will also reduce the appearance of existing ingrown hairs with visible results often seen in 24-48 hours. Tweezing is not needed or advised as resulting skin damage can increase the formation of ingrown hairs. Ingrown hairs continue to grow even though they are turned under the skin and large bumps and even cysts can form. It is not uncommon to have ingrown hairs 25mm or longer. If this is the case the hairs will need to be gently 'teased' out of the skin for the first time. To avoid risk of infection and scarring do not attempt to squeeze or 'pick' at them at home. We recommend consulting a qualified esthetician who will lift the hair/s out of the skin (they should not be tweezed out of the skin completely). 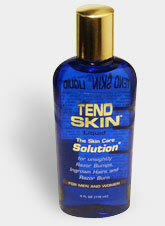 Tend Skin® liquid should then be applied night and morning for several days. The hair/s can then be removed by shaving, waxing, electrolysis. Tend Skin® liquid should then be applied daily until the new hair is seen to be growing above the skin. Avoid using Loofah pads or Buff Puffs where ingrown hairs or razor bumps appear. These abrasives can irritate the skin, and make the problem worse. Razor bumps are created when beard hairs exit the skin, curl over and burrow into the adjacent skin. When applied regularly, Tend Skin® liquid can effectively and safely reduce the appearance of unsightly razor bumps. Razor burn is a very common problem after shaving legs, underarms, bikini lines and in the case of men, the face and neck. Not only is the noticeable redness unpleasant, but often small yet painful red bumps occur. When applied after shaving, Tend Skin® liquid will go to work to reduce the appearance of the redness, soothe the irritation that causes the red bumps, and soothe the itching and burning sensation that can occur after such procedures. Tend Skin® liquid can also help to reduce the appearance of skin damage that can result from constant shaving with a blade. For your bottle of Tend Skin see your nearest Beauty Therapist. © 2003-2012 Appleton Associates Ltd. All rights reserved.